Our first few days were spent in Quito, the capital city of Ecuador. A main highlight was the walking tour of the city’s historic centre. It was fascinating to learn about how the city has evolved overtime while recognizing the need to protect its heritage. With its beautiful public squares, churches, narrow cobblestone streets and colonial facades, we could easily see why Quito has one of the least-altered historic centers in the world. If you ever find yourself in Quito, we highly recommend taking the TelefériQo (Gondola Lift), up to the Pichincha Volcano. At the summit which sits at 3,945 metres high, you will find incredible views of the city, local crafts, music and cuisine along with connections to hiking trails that travel along the mountain’s luscious terrain. It was interesting to see how this tourist attraction managed to successfully incorporate elements of transportation, nature and local traditions into an unforgettable experience. The Quitsata Sundial is located on the Equator in Cayambe, Ecuador. Here we were treated to a lesson in local history, and learned about the pre-hispanic cultures of the region. The depths of these ancient peoples’ understanding of the solar system. Of course, the highlight of this visit was the chance to celebrate Professor Altrows’ birthday with a delicious chocolate cake, sliced ceremoniously on the equatorial line itself. The next stop on our Ecuador adventure was the Otavalo Market, where we indulged in one of my favourite activities: shopping! The market was a lively place, with local men and women selling their wares. Our group took this opportunity to load up on gifts to bring home, haggling over prices in broken Spanish. Handmade alpaca sweaters, hand-woven tapestries, and hand crafted silver trinkets decorated individual tables, and by the end of the day, our rucksacks were full and our wallets significantly lighter. 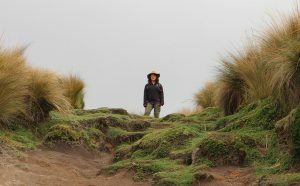 The trek from Quito to Shiripuno was an adventure, though I am hesitant to use the term “harrowing.” Our group was up at the crack of dawn, boarding the bus that was the first of three legs of the day’s journey. This initial ride was via the local public bus service – something we always enjoy doing when traveling, as it provides an opportunity for increased cultural immersion. At every stop, locals hoped on and off the bus, selling local snacks and trinkets, which was helpful, as our group had voracious appetites. It was the second stop of the day, however, which provided us the chance to taste a very fresh local delicacy. Misahualli is a riverside town with wild monkeys and the melodies of salsa intertwining in the public spaces. Here we picked up the last of our supplies for our time in the Amazon, and were treated to skewered, fire-roasted Tree Worms. We were apprehensive, but pleasantly surprised to find that they tasted very much like bacon… And a great source of protein to boot! 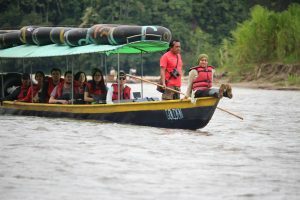 From Misahualli, we boarded the motorized canoes used by the local people to traverse the network of rivers at the northernmost point of the Amazon River System. There was something thrilling about that experience: Not just the smell of the rainforest, or the moisture-laden breeze on our faces, but the knowledge that the very water upon which we rode would eventually travel some 7000 km before joining the Atlantic Ocean. The Shiripuno Amazon Lodge is a community-based tourism facility, located in the Ecuadorian Amazon Rainforest. Here we were able to take part in traditional chocolate production, enjoy traditional dances, engage in nature hikes, and learn about the traditional keepers of the land, the Waorani People. 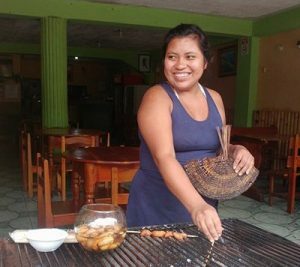 This community-based tourism allows communities like this one to maintain their cultural practices while generating sufficient income to survive in the new world economy. A pleasant surprise for me was the realization that this business is managed entirely by the female members of the community, with the majority of their male counterparts securing employment off-site. In this way the women are not only supporting their families and culture, but actually affecting positive change in their community in a very real way. This is more than just a citizen controlled endeavour – this is female driven prosperity. Baños de Agua Santa is a small town, tucked in at the base of the Tungurahua volcano. The natural landscape is breathtaking, and the small population of less than 20,000 creates a small-town feel. 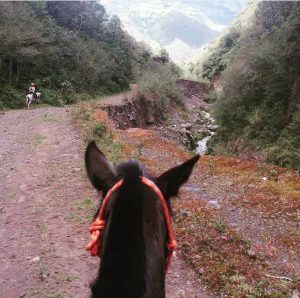 The town of Baños is surrounded by the Andean Mountain Range, so myself and a few other members of our group decided to mount our noble steeds and explore the area. We began with a trot through town, and we were immediately struck by the way the traffic moved around us. This triggered an immediate discussion about the shared use of public space (no surprise, as we are students of Urban and Regional Planning). This was not an auto-centric town, though the majority of people utilized automobiles as their primary mode of transport. It seemed that the importance of the tourist industry to the local economy had merged with the general respect for nature and all its members right there in the streets of Baños. Horns did not honk, nor did drivers become impatient; the horses did not fret or become agitated. This was something we had never seen on the streets of Toronto: Mutual respect for all modes of transport, where everyone felt safe and was afforded equal priority in the use of transportation infrastructure. Guayaquil was our final destination. It is the largest city and financial capital of Ecuador. We had the chance to check out the Malecón del Salado, a waterfront regeneration project downtown, which is one of the city’s many upgrading interventions that is catered towards attracting tourism and foreign investment. On our last day of the trip, we met with Professor Filiberto Viteri and students from the School of Architecture and Planning at the Catholic University of Guayaquil to learn about various projects happening on campus and throughout the city. 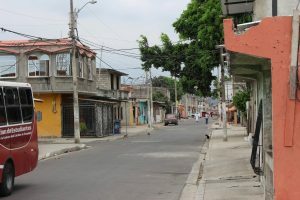 They were kind enough to take us on a tour of an informal settlement in the Guasmo district, an area that was illegally claimed by the people without any approval from local authorities. In spite of the lack of adequate infrastructure, I thought that the neighbourhood was vibrant, compact and well networked. Everything was people driven, it was nice being able to walk in a neighbourhood without seeing a Shoppers Drug-Mart or Tim Hortons at every corner. We learned that there has been tremendous progress as of recently because the city is beginning to grant legal rights to many of these informal settlements while also investing in infrastructure upgrades to support the needs of the people. With all the recent changes happening in Guayaquil, I anticipate a more sustainable future for the city. Ecuador was a great experience for us. We have always loved to explore and travel, and this trip allowed us to combine this with our newest driving interest: Urban and Regional Planning. 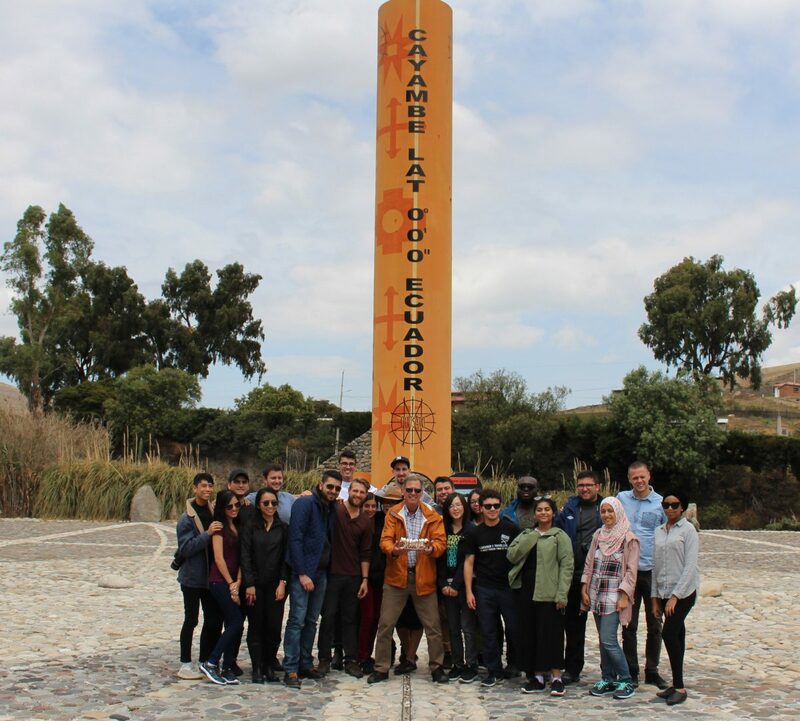 This trip opened our eyes to the multitude of potential applications for our planning degrees – from Strategic Planning to International Community Development. 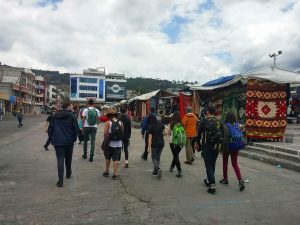 But we think the most significant part of this experience was the opportunity to connect with a new group of peers – those people who we had seen in the halls and perhaps exchanged pleasantries with, but had yet to engage with in any meaningful way. It sounds cliche, we know, but this was one of those big life moments for us – one of those times that we’ll look back on for years, grateful to have had the opportunity. And the best part is, we know that we’ll likely be looking back on this time, reminiscing with the people we did it with, because not only are they our current academic peers and future professional colleagues, but now they are also our friends.